What was it that made Toni Lander the dancer that she was? From her seventeenth year Toni Lander was a teacher. 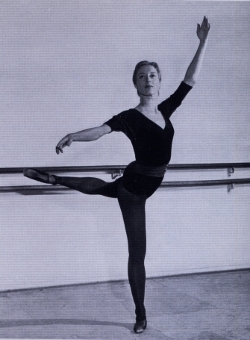 Harald Lander choreographed the ballet Etudes, her signature work, on her. It was young Toni that helped teach it to the company, The Royal Danish Ballet. Soon after its creation and triumph, Toni and Harald, now married, left Denmark and took up residence in Paris. News of the success of Etudes traveled quickly, and it was in demand worldwide. Toni had always said that she learned so much by teaching, by having to analyze and explain the mechanics of ballet. But just as important was her classroom learning method. Toni believed that the time spent in class not dancing was just as important as the time in front of the teacher. She noticed fellow students gossiping and rearranging their practice clothes when not up and dancing. She noticed them practicing (usually the steps that they already did well), when the other group was on the floor. She, on the other hand, watched and listened very carefully, thinking about the corrections given to others, and deciding whether that correction applied to her. She got twice as much out of class as the other students. Toni was taught classical mime by the legendary Valborg Borchsenius, one of the great mimes of the Royal Theatre. While classical mime can sometimes look like robotic semaphore signaling, Madame Borchsenius made it come alive with, again, a single and clear concept. Think before you speak (move.) Those moments of thought, those pauses between gestures, are the key to realistic-looking ballet mime. When Toni taught a ballet she would say, “this step ‘says’ this,” and then she would sing the music, not count it. The concept of the steps “saying” the music is, of course, one of the basic ideas of George Balanchine. “See the music, hear the dance,” was his credo. When you are counting you are not listening to the music, you are listening to the meter or beat of the music. The quality of a piece of music is in the sound not the beat. If your dancing is to have meaning, it must be truly musical and Toni Lander was pure music. Perhaps the most important thing Toni gave us was the love of dance, and by dance I mean all dance, and not just ballet. She finished her performing career dancing the work of Jose Limon, The Moor’s Pavane. We danced it almost 150 times and each performance, for us, was like the first. We learnt the ballet in 1970, I Othello and she Desdemona. After dancing it for the first time, Toni told me of her great sadness. She bemoaned the fact that she had come to Modern Dance at the very end of her performing life. She had, after all, a huge appetite for movement. It is said of so many, but she truly loved to dance. She loved to dance, not for what it might get her. She loved the doing of it and no one was more loved by her colleagues than this great Dane.